Luca Ciferri is Associate Publisher and Editor at Automotive News Europe. 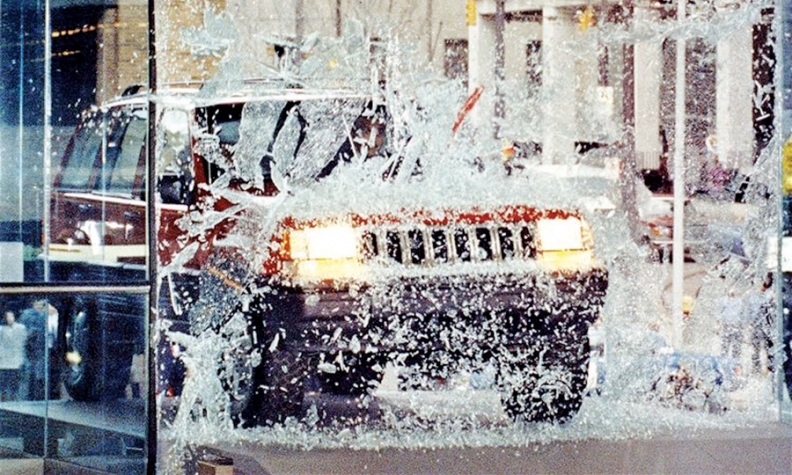 One of Tom Kowaleski's greatest hits: Having Bob Lutz crash a Jeep Grand Cherokee through a plate-glass window at Cobo Hall during the 1992 Detroit auto show. Nothing was impossible for automotive PR man Tom Kowaleski. Whether it was invading a beloved Italian landmark or literally crashing into the Detroit auto show, Tom dared to do it. I was there in the early 1990s when a photographer asked Tom whether it would be possible to take a picture of the first-generation Dodge Viper in front of Milan’s famous Duomo cathedral. Tom, who was leading the first ride and drive for the Viper in Europe, was puzzled by the request at first. Then he realized that a picture of the supercar in front of the Duomo would be a terrific PR for the Viper. One small problem: the square in front of the cathedral was a pedestrian zone. No cars allowed! Tom smiled and agreed to give it a try, relieved that he wouldn’t have to try to explain himself in a language he couldn’t speak fluently. He was always willing to find a solution regardless of how difficult the challenge. When the police came they didn’t demand we leave or issue us a much-deserved ticket, they just wanted as much information as possible on the Viper. There were no “selfies” in those days. If there were, we probably would have a few photos to prove the surreal event actually happened. Tom’s masterpiece, however, was getting former Chrysler executive Bob Lutz to drive a Jeep Grand Cherokee through a plate-glass window at Cobo Hall during the 1992 Detroit auto show. I doubt that entrance will ever be topped. Sadly, Tom died on Tuesday. It was unexpected. He was just 63. Tom’s career included key communications jobs at American Motors, Chrysler and General Motors. He retired in 2006 to become a consultant, first advising BMW in North America. He was assisting Ford’s luxury brand, Lincoln, until his death. To honor Tom I will always cherish the great times we had traveling around the world to test cars, mostly during his years at Chrysler. Also, I will be forever grateful to him for helping me become better at my job. Tom and his longtime mentor and boss, Steve Harris, allowed me to join a select group of journalists who were given an in-depth look at what it really takes to run a global automaker. I learned more during those seminars than I have in the rest of my 36-year career covering the industry. This loss has hit me hard because we just saw each other at the Detroit auto show last week. Today, I’ve been reflecting on Tom’s brilliance, his savoir-faire and his ability to convince usually ultra-conservative executives to give him their blessing — and their cash — to undertake his great ideas, even the crazy ones. Tom, you will be missed.